Reading the Korea Central News Agency’s dispatches (e.g., North Korean propaganda stories) makes for a good blast-off into larger works. Today, North Korea confirmed that it signed an agreement in Dandong for a new bridge across the Yalu. Distress over starvation in the countryside may have led to this return to Kim Il Song’s wisdom (vintage 1964) and his son’s resolve to “solve the rural question.” Although the translation is bad, recent news items advertising the abundance of “soup of entrails” (gop-ja chigae) in crowded city restaurants, no less than rumors of abundance in Seoul, could fuel a slight resentment. (Recent readings of Andrew Nastios’ immortal The Great North Korean Famine as well as Noland and Haggard’s Famine in North Korea, along with my own work with Chuck Kraus, remind me that people in peripheral provinces are some of the more disaffected.) North Korea’s regional dynamics (e.g., regionalism and the role it plays in allocation of state resources, border security, and internal unrest) need to be better understood. North Korean propagandists are getting bucked up by Kim Jong Il, which may anticipate an aufschwung of successor propaganda. Kim’s speech, entitled “Journalists and Other Media Persons Are Buglers Sounding Advance in Dynamic Drive for Building a Great Prosperous and Powerful Nation”, was delivered by Kim Yong Nam to journalist-propagandists and a number of heavy hitters at this meeting in Pyongyang. Pyongyang, February 24 (KCNA) — General Secretary Kim Jong Il issued a famous work “Let Us Compose Revolutionary Musical Pieces Which People Love to Sing” on February 25, Juche 79 (1990). In the work, he underscores the need to create revolutionary songs inspiring the people to do their best in socialist construction as well as emotional songs reflecting diversified aspects of their life. Noting that musical pieces conducive to educating the people in a revolutionary manner such as those about the Party, fatherland, socialist system, revolutionary traditions and national reunification should be created in large number, he clearly indicates ways for this purpose. Since the work was published, many songs reflecting the spirit of the times have come out to further develop Juche-based musical art. “Leader Is Eternal Sun of People”, “Our Leader Will Always Be with Us” and “When We Walk along the Road between Fields” represent well all the Korean people’s reverence for President Kim Il Sung. “Our Comrade Kim Jong Il”, “Thunder over Jong Il Peak”, “General’s Inspection Tour of the Front” and “Let Us Hold High the Red Flag” sing of Kim Jong Il’s strong will to defend the red flag and pursue Songun politics. Meanwhile, songs reflecting labor and sentiments of the people and those suitable to the era of Songun have also been created. 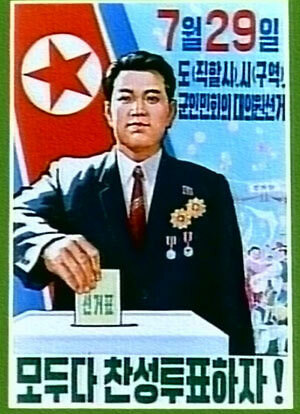 The songs are now encouraging the Korean army and people in the effort for the building of a thriving nation. Reframing Kim Jong Il’s considerable output on the role and method of music composition for the purpose of present needs must indeed be an absorbing task for North Korean propagandists and arts workers. Environmental protection efforts are continuing with some difficulty in North Korea, bound up with questions of state control and reductions of “patch farming.” One often forgets that among the greatest enemies of regime stability in the DPRK are earthquakes and floods. I love North Korea, as a proud citizen of it! Shame Americans! WE have nuclear bombs!